This is the last in a three-part series on the Bushwick neighborhood of Brooklyn. The relaxed intimacy and DIY ethic of the Bushwick art scene extend to the art made and exhibited here. Of course with thirty galleries and thousands of artists, every conceivable kind of art is made and shown here. But you're not going to find much super-sophisticated, flashy postmodernist work. Sincerity predominates, and what irony exists is good-natured and playful. 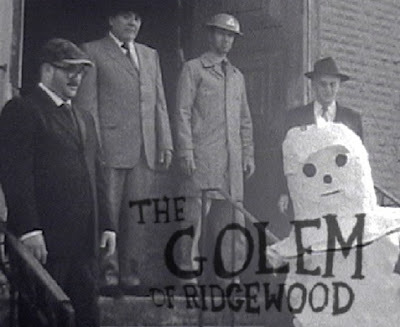 Matt Freedman's exhibition The Golem of Ridgewood at the Valentine Gallery (through March 11) is a prime example. The show revolves around a film we are suppose to believe is seventy years old and was discovered in an old synagogue near the gallery. The film purportedly documents the creation of a Golem (a destructive and uncontrollable monster) that was employed by the synagogue' s congregation as protection from its anti-Semitic neighbors. But the show's a lot more than a zany spoof. The Golem is a deep-rooted archetype (think the atomic bomb), and there are moments when I got caught up by the imagery and thought how desperate a people must have been to resort to such a dangerous (and cockamamie) weapon. Perhaps the reason I could be so moved is I never felt Freedman was being unkind or ridiculing people, or even just being insensitive. There's fun here, but there's true sympathy too. Especially effective in this regard is a life-sized carnival-type backdrop depicting a strong-man strangling cartoony caricatures of Hitler and Mussolini, one in each hand. The face of the strong-man is cut out to allow people to stick their own face in and have their picture taken. Of course I know that Matt Freedman really made this thing, but I'm still moved by the idea of a powerless people doing whatever they could, however lame and pathetic, to boost their morale. In addition to the film, the exhibition includes "recovered props and artifacts related to it" (very much hand-made ones) as well as a "timeline" (compiled with "consulting art-historian" Frances Rabinovitch) to "contextualize these fascinating relics." Most of the time the connection between the film and the "contextualized relics" is pretty far-fetched, a creepy knight's gauntlet sticking straight out of the wall, for example, but that adds to the whacky fun. 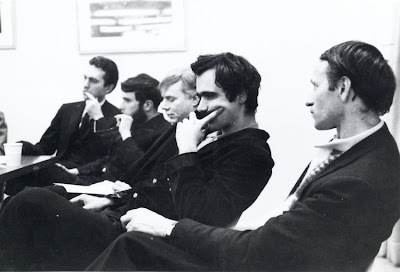 Film-Makers’ Co-op Press Conference, 1964, L to R - Gregory Markopoulos, P. Adams Sitney, Andy Warhol, Ron Rice (Jonas Mekas © 1964). We are Cinema — 50 Years of the Film-Makers’ Co-op (through March 5th) at MICROSCOPE gallery is a serious, historical exhibition, a show PS 1 or the New Museum should be doing. It's another commemoration, but a real one: the 50th anniversary of the Film-Makers' Co-op, now the largest repository of avant-garde and experimental films. It was initiated by Jonas Mekas who gathered about 20 other avant-garde filmmakers in order to find ways to independently archive, exhibit and distribute their films. In addition to early archival materials, the exhibition has photographs, collages, drawings and other art made by former and current members including Jonas Mekas, Rudy Burckhardt, Carolee Schneemann and Jack Smith. The gallery will be screening films all month; see their website for the schedule. 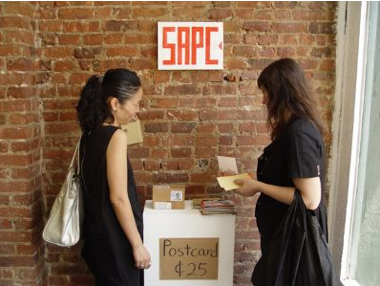 Agape Enterprise, SAPC Bushwick , Shinsuke Aso's three-day performance (February 17 - 19) celebrated the opening of Shinsuke Aso’s postcard shop SAPC (Shinsuke Aso Post Card). Shinsuke cut up cereal boxes, soap boxes, and other found materials to make hundreds of postcards which he taped to the gallery walls salon style or stacked in piles and sold for 25 cents each. People took the ones they liked right off the wall (to be replaced by others) and deposited the change through a slot in a can hanging from a string in the center of the room. This is art for the other 99% of us. It reminded me of the C.A.S.H./Newhouse gallery in the East Village in the early eighties. They had a shoe box on their front desk full of small works that you could buy for ten or twenty dollars, or some small amount. This show is in the same democratic and generous spirit. The exhibition is also about recycling, of course, but in addition it says something interesting about graphics. As Pop Art showed, the graphics on the packaging of consumer products is usually pretty good. Strategically cropping the cardboard packages at unusual angles abstracts the graphics, allowing you to appreciate the beauty as pure design. Some are better than others, of course, but that's part of the fun -- you get to choose your favorites. Full disclosure: I'm one of Shinsuke Aso’s biggest collectors. Two dollars means nothing to me! Installation view of Paul D’Agostino's exhibition, Appearance Adrift in the Garden, at Norte Maar. Paul D’Agostino's exhibition at Norte Maar, Appearance Adrift in the Garden, is getting some deserved attention. D'Agostino is one of those scary smart people. He's a translator and poet in at least four (update: it's five!) languages. His reading of his poetry last week at Norte Maar was as good as anything I've heard at the Lillian Vernon Creative Writers House -- and that includes Mark Strand. In addition, he's the owner of the well-respected Centotto gallery, and, if this show is any indication, he's a first-rate artist. Most of the work is unframed prints and mono-prints on rough paper surfaces, and there’s an occasional collaged painting on paper. Like a lot of the work I’ve been seeing in Bushwick, these paper pieces have a very tactile and hand-made quality. They’re small, intimate, heavily-worked and dense. They need to be looked at carefully and savored. D’Agostino's newly-published limited-edition chapbook, Bodies, Voids and a Tale of Seas, accompanies the exhibition. Elizabeth Riley, Tabletop Cityscape, 2010, 42 x 48 x 84 inches, inkjet prints of video stills, found wood, mixed media, live videomini projector and embedded video monitor. Martin Bromirski, Rachel LaBine, and Elizabeth Riley, StorefrontBushwick (until March 11). This is a three-person exhibition of semi-abstract art. I particularly liked the Riley’s “Tabletop Landscape” which she said was inspired by walking around Manhattan in the west 30’s and 40’s where she used to live. 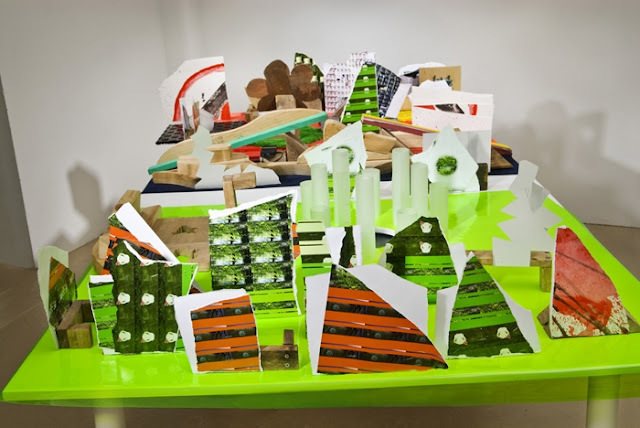 There’s certainly plenty going on, and she captures it using mini-video projections, small sculptures, prints, found wood and mixed other media -- all set on a 4 x 8 foot table. This is a small, active, exuberant, self-contained world. 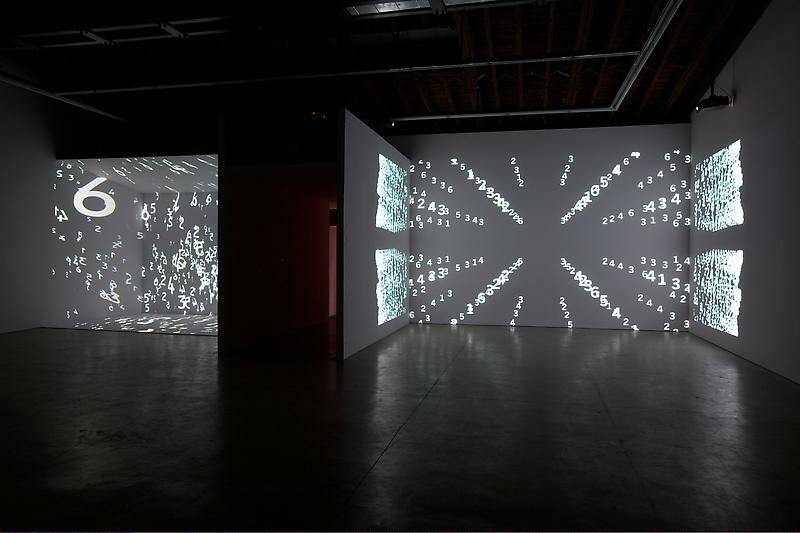 Charles Atlas, The Illusion of Democracy (until May 20) includes three video installations, Painting by Numbers, 2008, and Plato’s Alley, 2009, and a new one made specifically for the opening of the Bushwick branch of this blue-chip Chelsea gallery. This is large, polished and theatrical work — a grand spectacle (some reviews related it to the movie Matrix) — not at all the Bushwick aesthetic I've been describing, but I must admit it was pretty impressive, even exciting sometimes, as when the numbers were projected on the audience. 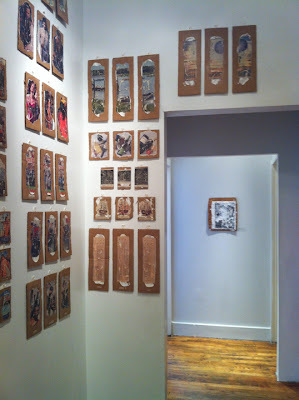 Thank for these great posts on the Bushwick art "seen," Charles, and really nice to be included!! Book Review: Julian Bell, "Mirror Of The World."